This mineral-based, oil-free, ultra-sheer tinted moisturizer with SPF 20 comes in seven natural shades and features an outstanding blend of ingredients like Ginseng Root Extract, and Vitamins A, C and E to help the skin look and feel great! This is the perfect natural glow makeup for the summer time and is one of my favorite products from the Beauty Addicts line. Formulated with pure pearl powder to stimulate cell renewal and packed with green tea and vitamins A, C, D and B5, this matte bronzer is perfect for contouring and creating the most natural-looking tan all year round. A unique duo designed to highlight and illuminate the eyes, face and cheeks. Glimmer - a soft focus luminizing luster for a sun-kissed, elegant sheen. Sheer - a crystal clear balm that hydrates and enhances glowing skin. A MM favorite! Features eyeshadows in shimmery, matte and frost finishes -- perfect for creating classic smokey eyes and ready-to-wear every day looks. 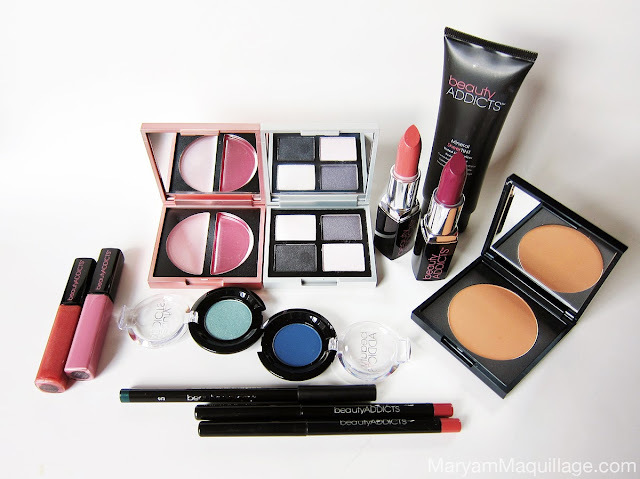 Super fine, crushed pearls give a burst of long-lasting, shimmering color and highly-pigmented, consistent application. Intense, dramatic lashes with one easy stroke! This unique formula offers volume, length and curl with Argan Oil to condition and protect and truly works, even on my short lashes! Prime your lids and allow a few seconds for the primer to set. Apply a soft shimmery pale pink shadow all over the lid, from the lash line to the brow. Use a dome shaped brush to apply a plummy gray shadow to your crease, concentrating the color on the outer corner. Deepen the crease and outer v with a dark gunmetal gray shadow on an angled brush. Add the same color to the outer third of the lower lash line. 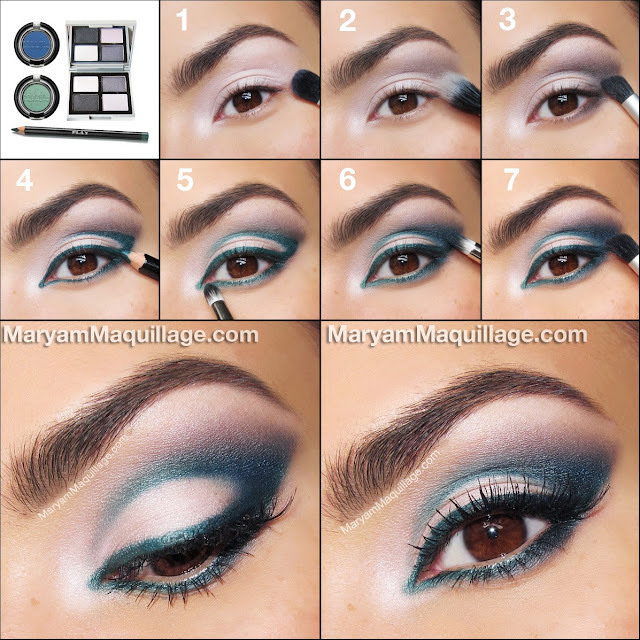 Line the entire eye with a peacock green pencil liner and outline the outer two thirds of the crease (or where you want your crease to appear). 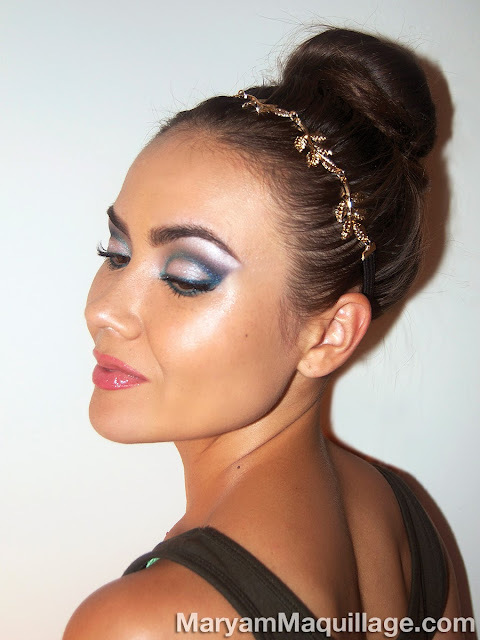 Use a small detailing brush to add a shimmery mint shadow to the inner third of the liner and crease. Blend any harsh edges to make the line soft. 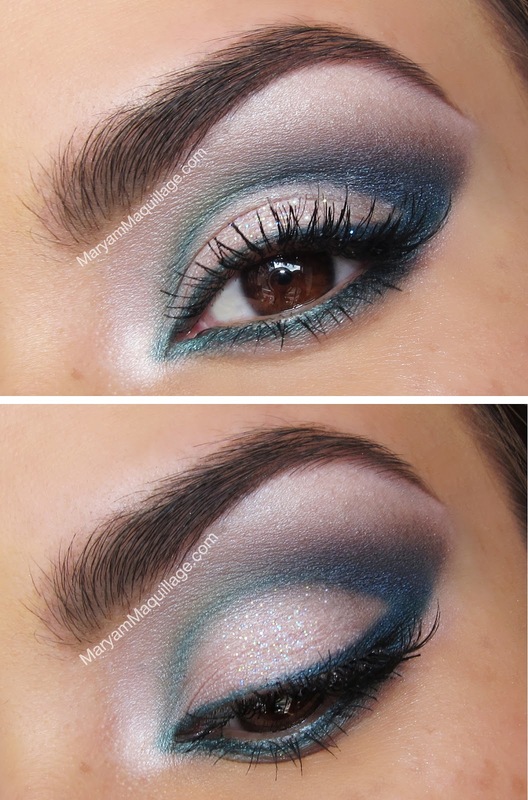 With the same brush and technique, add a matte bright blue shadow to the outer two thirds of the liner and crease. Continue blending to soften the edges. Re-emphasize the outer v with the darkest gunmetal gray shadow and add mascara to the top and bottom lashes. 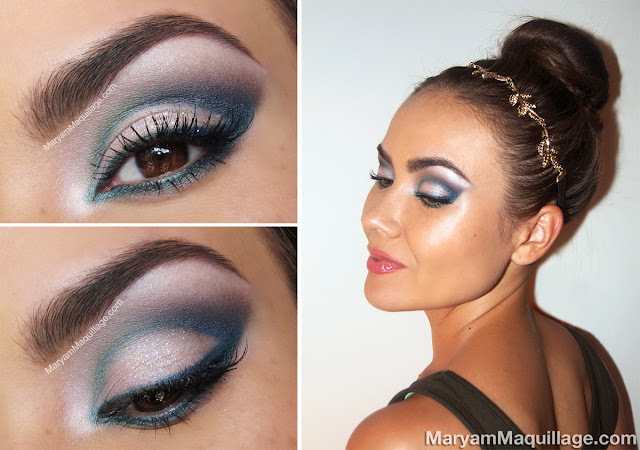 Optional: Add pearly glitter to the lids to give your eyes a dose of ethereal romanticism. The most perfect natural peach anti-feathering liner that also plumps, firms and locks in moisture in one easy glide. Infused with vitamin E, shea butter, jojoba oil and other natural ingredients, this formuala also plumps with Natural Peptides and stimulates collagen for a firmer, smoother more voluptuous lip. This vanilla-flavored high-shine gloss hydrates lips with Vitamin E and Jojoba Butter. Hope you have a great, playful, Sunday-Funday!! Очень люблю Ваш блог не только за красоту хозяйки и художественные макияжи, но и за ощущение добра и тепла, от Вас исходящих. seriously...do my makeup! you're amazing! Gorgeous! Definitely going to try and recreate! Thanks for the pictorial! Simply GORGEOUS! I will try to recreate this, thank you for the lovely pictorial. Love it! Was für wunderschöne Augen du hast und mit dem passenden Make up kommen sie noch viel mehr zur Geltung. Sieht echt super schön aus.